The suspend/resume sleep feature is, however, not included. 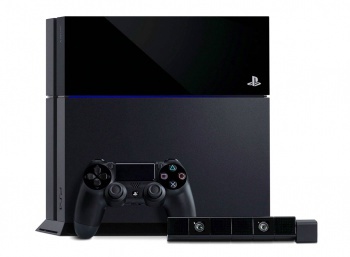 Many features will not be available for the PlayStation 4 out of the box. A 1.50 System Update will be available on Nov. 15, the day the console launches, and will add several new features; however, the suspend/resume mode will not be available at launch. The 300 MB update will add remote play, second screen, uploading of gameplay, broadcasting of gameplay, play as you download, multi log-in, party voice chat, face and voice recognition, a background music player, online multiplayer, and blu-ray disc and DVD player. The console will not support a lowered-powered sleep state that allows users to jump back into a game when resuming use. People with a PS4 and a PS Vita can use remote play to take most PS4 titles and play them on the Vita using WiFi and PS4 Link. The upcoming PS Vita system software version will be required to use PS4 Link, which is also needed for second screen functionality. One of the cooler features of the PS4 is the ability to upload and broadcast gameplay in real-time via Ustream and Twitch. For anyone buying the PlayStation Camera, the update will allow users to register their facial image onto the PS4 system. The microphone of the Mono Headset bundled with the PS4 or the PlayStation Camera can be used to navigate through the PS4 home screen. Voice recognition will allow commands to turn on and off the PS4. Sony will provide more information about the update and features available after launch "in the near future."